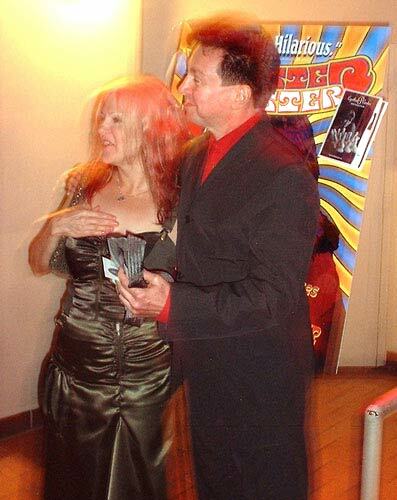 Cynthia Plaster Caster and Gerald V. Casale shown here as they met at a 2003 DVD release party for the movie PLASTER CASTER.- a portrait of legendary artist and groupie, Cynthia Plaster Caster — famous for plaster casting the penises of rock stars, including, most notoriously, Jimi Hendrix. The film explores how Cynthia developed her unique pursuit, follows the ups and downs of casting sessions with a shy guitarist and an extroverted glam rocker, and goes along for the ride as Cynthia prepares for her first gallery show in New York City. Featuring candid interviews with "castees," candidates, and commentators — Noel Redding (The Jimi Hendrix Experience), Jello Biafra (The Dead Kennedys), Eric Burdon (The Animals), Pete Shelley (The Buzzcocks), Jon Langford (Mekons), Wayne Kramer (MC-5), Paul Barker (Ministry), as well as author Camille Paglia and artist Ed Paschke — PLASTER CASTER goes beyond the mythology and asks the question, "is it really art?"